The graduating class has been challenged to reach 200 donors before commencement in spring 2017. If we reach our goal, we will get an emblem placed along Niner Walk near the stadium dedicated to the class of 2017. Make your gift today! This year, the Senior Class is staking their claim through a brick campaign to benefit the Evergreen Scholarship. Every gift of $49 or more, made by or on behalf of a graduating senior, will be honored with a personalized brick in 49er Way. We want your help in donating to this fund! The Evergreen Scholarship is awarded to an undergraduate student who has demonstrated financial need as determined by the Office of Financial Aid. As seniors, we understand how much a scholarship can truly alleviate stress and in return allow students to better focus on their studies. A scholarship like this one, makes education and career goals easier to obtain. Your support of the Senior Class Gift gives fellow 49ers a future to believe in. Please enter your desired brick text on the following page under the additional gift details section. *One line of text includes 15 characters/spaces. 49er Way is a brick walkway located between Cameron Blvd and Jerry Richardson Stadium and is the path the team, the band, and many alumni, students and fans take from the Hauser Alumni Pavilion to the stadium during home football games. It is also one of the most traversed, and most photographed, routes on the UNC Charlotte campus. The Senior Class Council captivates seniors at the University of North Carolina at Charlotte by promoting growth, inclusion, and unity. UNC Charlotte reserves the right to approve all inscriptions prior to production. Pick up your senior class t-shirt with a suggested donation of $10.00. Honor your fellow graduates with a gift of $20.17. Every gift of $49 or more, made by or on behalf of a graduating senior, will be honored with one line of personalized text on a brick in 49er Way. 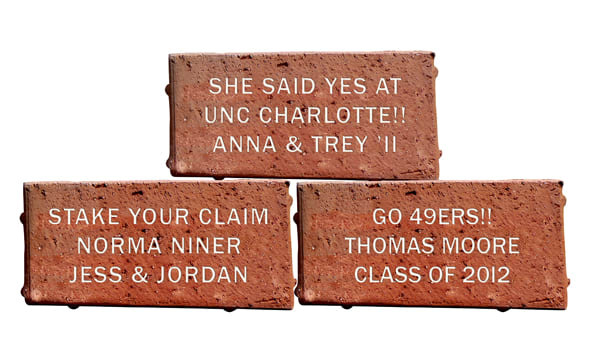 Every gift of $149 or more, made by or on behalf of a graduating senior, will be honored with up to three lines of personalized text on a brick in 49er Way.